The patented self-aligning bearing system behind the Official IGSA Downhill Speed World Record – 80.83 mph by Mischo Erban! New-and-improved construction with broader flanges, tighter assembly tolerances, and dust-resistant ball retainers! TRUE: Broader flanges mean self-alignment that’s better than ever. No other system keeps your bearings this straight. TIGHT: Refined construction allows for tighter assembly tolerances, which means less torsional play. SWEET: Precision-machined, color-anodized flange “cap” is press-fit to the bearing body. Simply gorgeous. SWIFT: Truer, tighter bearings means wheels that roll faster, corner with more grip and control, and slide with minimal chatter! 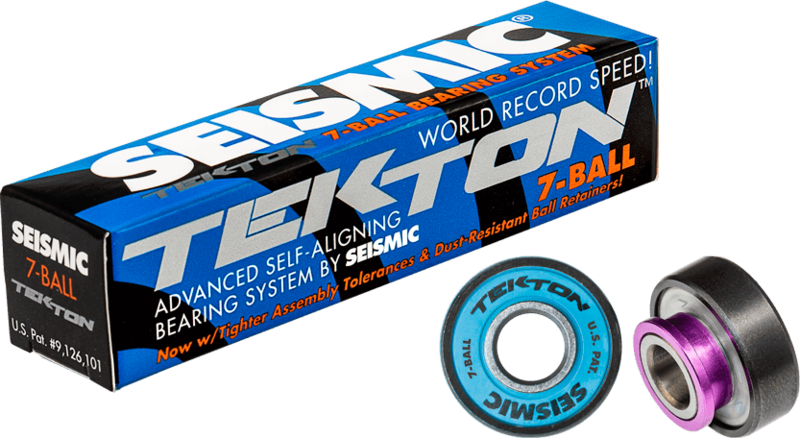 Seismic® Tekton bearings feature wide, flat contact surfaces at the ends of integral half-spacers. Now larger and color-anodized, the broad flanges square up, co-align and self-stabilize inside your wheels – correcting more than ever for flaws in bearing seat levelness and spacing / axle diameter and straightness. Self-straightening: Prevents bearings from sitting or rocking out of alignment better than any other system. Self-supporting: Protects bearings from internal stresses that accelerate wear. 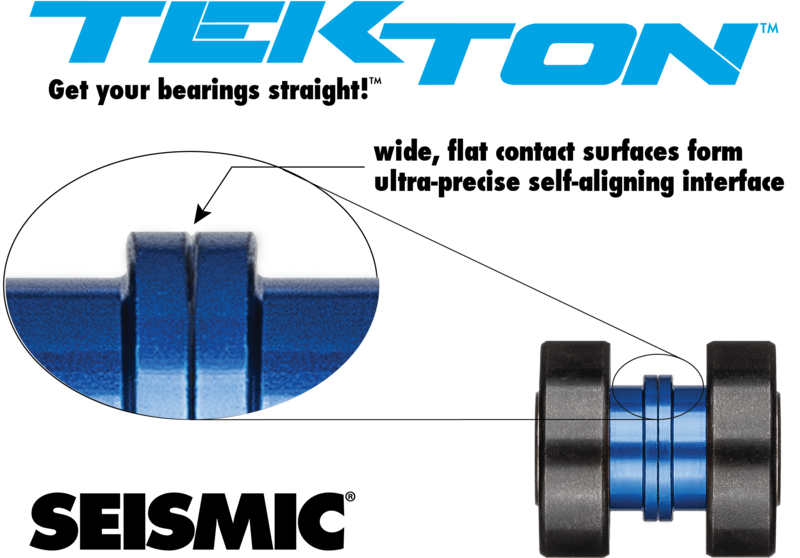 Tighter assembly tolerances mean less torsional play within the bearing body, while the patented Tekton self-alignment system minimizes torsional play in relation to the axle. The two features combine for faster and more precise roll; more consistent wheel contact and grip while cornering; more predictable slide release and hookup; and longer wheel and bearing life. 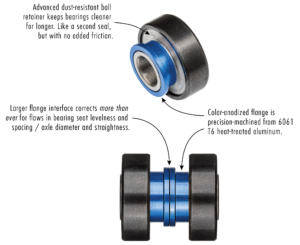 Now assembled with advanced dust-resistant ball retainers to keep your bearings cleaner for longer – without the added friction of a second seal. Other features include: top-grade P4 steel balls, black outer casings, removable rubber-coated steel seals with printed graphic, and high-end Japanese Kyodo grease. Construction meets or exceeds all requirements for ABEC-7 rating.